The path for most of us, takes us on very different routes and sometimes it is not the easiest route to take. As a matter of fact it is usually full of many speed bumps for all of us. Sometimes the Norns weave a web for us that tests our spirits, our hearts and our commitment to the Gods and Goddesses which will push us to find our own ways. Steadfastness, the ability to stay focused and a good dose of stubbornness is needed in every Odinist that is working to further the awakening of the folk spirit. It is up to each and every person to decide on how they are going to fulfill their life and what path is meant for them. My path has been a truly twisting one that has lead me through many turns and has put me in many situations and tested my core time and time again. One of the main things that I have learned through all these years is that most of those crossroads that have been laid in my path, have all gone to educate me and make me the man I am today. Not all of it may have been positive to who I want to be, but over the years I have learned to slow down and evaluate which fork in the road is best suited for me. When I first started this journey I was a young knuckle head who had to learn everything the hard way. I made a lot of mistakes in the past, and some of them have cost me a lot in many aspects of my life. I am not here to dwell on that or to blame others for those mistakes. They were mine and mine alone. I also wonder if not for the mistakes, then who would I be now in my victories? Would I have been able to learn and see that I was living a life of hypocrisy and falsehood, while at the same time trying to further my awakening, learning the way and striving to make contributions to the faith and folk? I have learned to see the ways and know the differences between living a hypocritical falsehood that does nothing but set the awakening back with every negative action, and really living in the true path that will make a positive impression on folk and family. In my growth I have come to realise that most changes happen slowly and it takes steadfastness to bring positive changes in the areas that can be changed or helped. Another huge aspect to life that is sometimes hard to face, is to have the wisdom to know when a cause is lost. I cannot be the “saviour of lost souls” for the ones who do not want to see the truth or who would rather drag me down with no regard for anything other than themselves. I have learned that it is not my responsibility to judge and correct everyone else in their path. I can only make sure that I live my life the best that I can with all the ethics and morals of a true Odinist. Now I only do what I can do and at the same time stay in the limits of reality. In the more recent stages of my growth I have come to develop a reserve of patience that I never knew that I had, and for me that is a lot. Over the years I have run into a lot of road blocks and speed bumps in my own personal growth and no matter how many times I am lucky enough to have my very good friend and shield maiden Laurel explain something to me I always have five more questions for the one that got answered. The past couple of years have been full of tests, not of the physical feats of bravery, or strategic planning, but more of the growth of my personal insight and ability to look forward to the future and what I can really do with my experiences. I am not sure what that is, if anything, but I am still moving forward and that is the direction that is best. I presided over our Midsummer Blot recently; it hadn’t been since last Midsummer that we had had the good fortune of being able to gather in good company like that. The small group who attended made the experience of that great day what it turned out to be. They are the few kinsmen that I have in my surroundings that are true to the Gods and Goddesses. It was sunny and hot out in the early day as great Sunna was just starting her journey across the sky and we had a really great morning out by the fire. Many boasts were made and plans for the next cycle were laid out. Again it was very hot out so needless to say there was a lot of sweating that day, but even so at the end of the sumble we were still not ready to leave. That to me says that we all felt the presence of our ancestors, gods, goddesses and the energy of the land itself. Looking back now I reflect on the early days of my first blot which Laurel conducted and how I was blown away by the feeling it brought upon me. I knew then that I had found my true calling and that something that I knew was always inside of me ignited. I was so overwhelmed at the time that I had found kinfolk that thought the same way as I. Before then I had the naive thought that I was the only person out there that saw things the way I did. Since then I have not been able to satiate my thirst for knowledge but instead have grown to understand that I will never know all that I want to, but yet at the same time I can accept that and move on with what I can accomplish. I have found a balance of being able to help others in their path and yet help myself at the same time, and that is very important, because if I am not moving forward, then I am just being in a state of stagnation and that is the sure road to extinguishing that flame which has been burning inside me since the first day of my awakening. 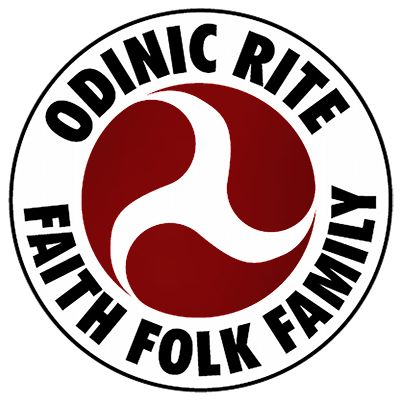 I am very thankful to all the folk of the Odinic Rite for their dedication and persistence. It has been the one constant in my path that has always stayed consistent and has always inspired me to keep up with my studies. I raise my horn to all in the OR and thank you all for your persistence. The path for many has been enlightened and illuminated by your insights.